A project I’m working on is a Nixie clock… in these posts I’m going to show its development!Nixie tubes are electronic devices for displaying informations (usually numbers); they were born in 1955 by Burroughs Corporation, which owned the name Nixie as a trademark. They work like neon tubes: with high voltage (about 170V) between anode – the frontal wire-mesh – and cathod – each number – the gas within the tube glows. 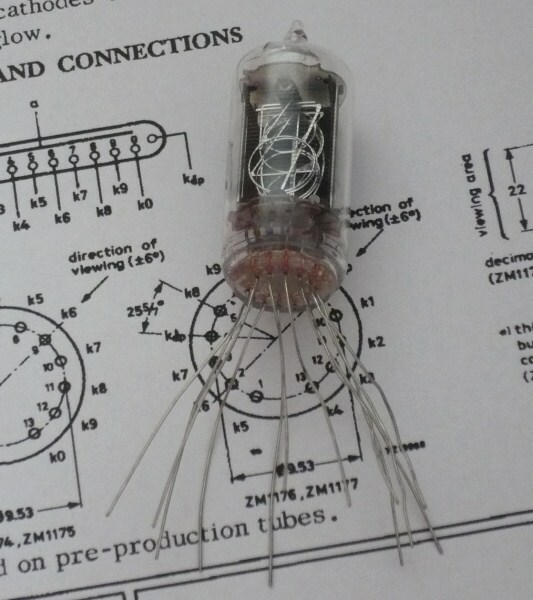 Some years ago I brought at an electronic faire 4 Philips ZM1177 tubes (here’s their datasheet) and now I’m going to build a clock with them. One of the main difficulties with Nixie tubes is the high voltage you need to supply them. 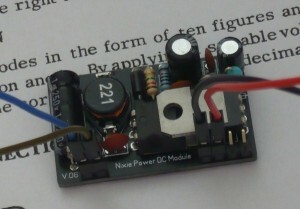 In the Net you can find several projects about how to get that voltage level from a low voltage power supply (9-12V)… after some research I chose a power supply based on Maxim MAX1771, step-up DC/DC controller. Kosbo.com website sells a PSU (power supply unit) based on that IC at a very interesing price (about 14euro)… the project is well documented and the author gives you its schematics too. In the next posts I’m going to show how to drive Nixie tubes from a microcontroller and how to build the clock… stay tuned! Whats the model of that graduated power supply you are using in the video? It looks cool. Hello! It’s labeled “PS-305″, it’s sold with different brands on eBay and webstores. Ciao, sul sito Kosbo.com non sono riuscito a trovare il modulo di alimentazione, forse non lo vendono piu’?